As we wait for our flights or stand in line to go through TSA -- we've all seen an airport K-9 dog sniffing around us. TUCSON, Ariz. — As we wait for our flights or stand in line to go through TSA -- we've all seen an airport K-9 dog sniffing around us. Tucson International Airport's has three K-9s on their explosive detection canine unit. Each dog the handlers work with have different personalities, but they all have the common goal of keeping those at the airport safe. "There another great asset that we use. Their noses are amazing. We just do the whole terminal area, we do the parking lots, the vehicle. Out there on the ramp of the aircraft. Primarily everywhere where the passengers will be and behind the scenes as well," said officer Daniel Mesa, who's been a K-9 handler for five years. But even with the high importance of their jobs, they are still dogs who love reward. Handlers have to make sure the dogs have a healthy balance of praise, with the reality of sometimes not finding explosive devices. That's why airport K-9s are trained as focus dogs. "The idea is that once a dog encounters an odor, the dog will then sit and focus on it, thinking that the reward that the dogs gets comes from that odor. We run a whole bunch of blank searches with the dogs to, to keep the dogs motivated. 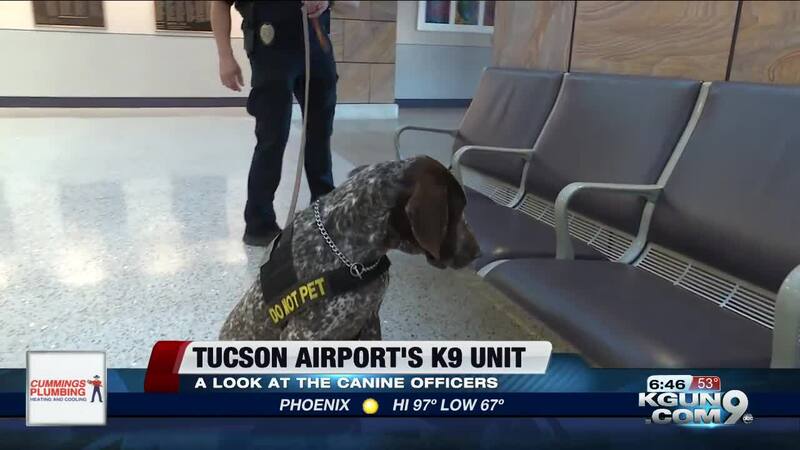 We run a real fine balance between training aids and blank area, because we know a lot of the times we run the airport, we're not going to find anything," said officer Jason Ryan, Tucson Airport police department's lead canine handler. The handlers go through rigorous training with their dogs - training that never really ends until retirement. "I just love with the dog. Its real incredible to see what they can do once you get them to their full potential and the way they serve the community and are able to help people out with them," said officer Nicholas Thompson, who's been a K-9 handler for seven years.